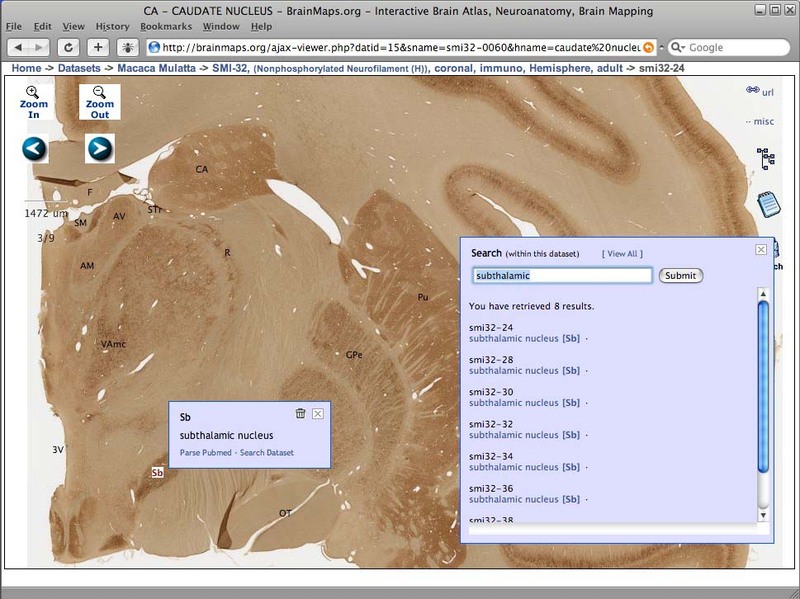 You may query the BrainMaps database for neuroanatomical structures, terms, and keywords. There are two types of searches: 1) searching across datasets, and 2) searching within a dataset. To search across datasets, use the basic query box at the top of this page. You may view all brain areas and brain objects by submitting an empty query. To search within a dataset, click on the search icon on the right side of the image viewer to bring up a search dialog (as shown in the figure below). Brain images selected after running a search will have the search term labeled in red, enabling quick identification of the spatial location of the search object of interest. While viewing brain images, you may also search within a dataset using the Search button on the right. You may also view all labels within a dataset by selecting "View All" from the Search menu. This is shown in the figure to the right, with the search term, the label "Sb", shown in red.